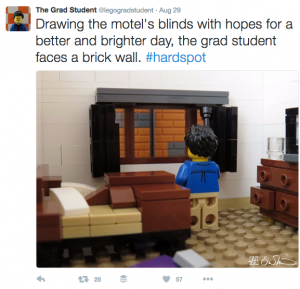 Lego Grad Student has fans across disciplines, who often use some variation of “devastatingly true” to describe his experiences. Indeed, his tableaux focus not on the intricacies of his research but rather on the human experience of graduate school: feelings of being on a treadmill to nowhere, being beaten to the intellectual punch by colleagues, using sophisticated avoidance techniques during a class discussion and the horror of seeing free food disappear before his eyes at departmental events. If you’re in graduate school, if you have friends or relatives who are in graduate school, or if you’re just interested in graduate school, you owe it to yourself to follow @legogradstudent on Twitter or Instagram. 134 years last June, if you must know.